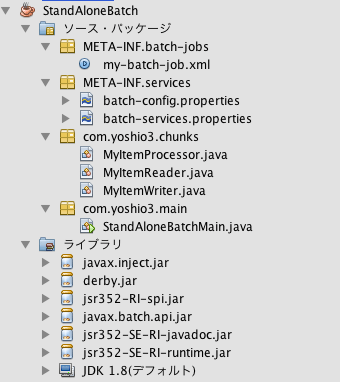 情報: JBATCH schema does not exists. Trying to create it. 情報: CHECKPOINTDATA table does not exists. Trying to create it. 情報: JOBINSTANCEDATA table does not exists. Trying to create it. 情報: EXECUTIONINSTANCEDATA table does not exists. Trying to create it. 情報: STEPEXECUTIONINSTANCEDATA table does not exists. Trying to create it. 情報: JOBSTATUS table does not exists. Trying to create it. 情報: STEPSTATUS table does not exists. Trying to create it. Entry filed under: Java. Tags: Java, Java EE 7, jBatch.